Now that the bliss of completing Book 2 has worn off, I’m suffering serious existential angst. Part of me wants to immediately start Book 3; part of me wants to immediately revise Book 2; and part of me wants a vacation. For the moment I’m listening to the lattermost part of me, since that’s the part that’s making the most sense — after cranking out 100+ thousand words, anyone would need a vacation. It cleanses the mental palate, so to speak. However, since I’m planning to attend a number of conventions this year, I don’t feel quite justified in gallivanting off to Morocco or wherever, price-wise. So I’ve decided to do some staycations around New York instead. Today was the Cloisters, a medieval art museum set in a gorgeous monastery-like structure and series of gardens (actually comprised of several medieval cloisters that were pretty much airlifted from Europe to here; there’s a reason people were in awe of the Rockefellers) on the north end of Manhattan. 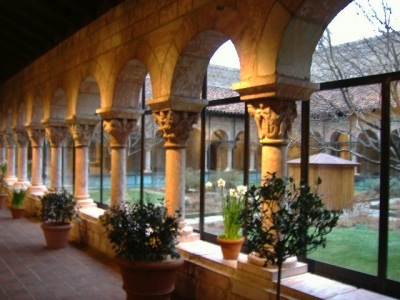 The Cloisters are themselves located in a fascinating place: Fort Tryon park, one of several large patches of greenspace in upper Manhattan. Today was the perfect day for it, too — gray and a little flurried, quiet and amazingly still. I enjoyed the park as much as I enjoyed the museum. Y’know, I think winter is becoming my favorite season. Though I have to admit, the museum wasn’t what I was expecting. I’d been hoping to get more Cloister, less museum, so to speak. I couldn’t really immerse myself in the feeling of being in medieval castle the way I was hoping to, because there were all these display lights and explanatory plaques everywhere, jarring the illusion. I’m not all that fond of medieval art — it’s beautiful, but nobody ever seems happy in it, though I suppose that’s why they called ’em the Dark Ages. But I love medieval architecture, and there wasn’t as much of it as I’d hoped to see. And my camera, an old Fuji Finepix, failed me utterly; some of the best photos I took came out blurred because my shutter button has gotten crotchety and I have to really shove on it to make a photo. Which of course jars the camera and ruins the picture. ::sigh:: If I had a million dollars, I’d buy a digital SLR camera and some software to make High Dynamic Range images (like these, if you don’t know what I’m talking about). But I don’t, so I guess I’ll look into an updated Fuji. And hope that Book 1 sells really well. Ah, see– for my tastes, at least, you’re there in the wrong season. My favorite thing in the Cloisters is the two gardens– the little flower garden in the courtyard, which is joyfully bee-filled by August; and even more, the herb garden on the patio (deck? Dunno what to call it) with all the lemon balm, fragrant thymes, fig tree, rosemary, and other authentic medieval kitchen-garden and medicinal plants. That place, more than the rest of the Cloisters, is what gives me a little historical thrill– which is probably because it’s the only bit of the history that’s genuinely still alive, in its cultivated way. Hurray for horticulture, I guess. And it has that fabulous view of the Palisades, which certainly doesn’t hurt. Mostly when I go there, I pretty much go to sit in the gardens.